As a travel writer, I fly a lot! 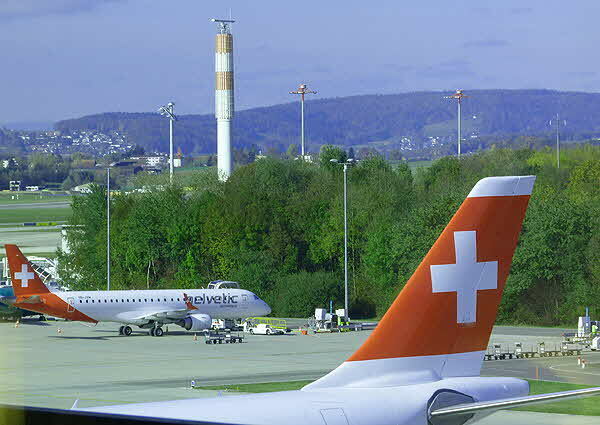 Recently I flew SWISS from New York’s JFK to Zurich. After passing through security I went to the SWISS lounge which was clean and nicely maintained with comfortable leather armchairs for working or lounging and an island of clean tables for eating. WiFi was offered free on entering the lounge and outlets for recharging were numerous and scattered throughout the facility. The food offerings were constantly being refreshed and on the occasion of my visit they offered nicely cooked and seasoned roast chicken, mixed rice, cooked vegetables, and fresh fixings for salads, plus a selection of cheese and fruit. A chef was making pasta dishes to order with a choice of different dressings and there was hot home-made soup with crispy breads and crackers. Of course the dessert selection was extensive and appealing and there was every drink type available according to your preference from hard liquor to wine, beer and soft drinks, to gourmet tea selection, to individual serve coffee machines with high-quality coffee that for me is so essential when traveling. The lounge was within easy walking distance from the SWISS departure gates and the plane departed exactly on time giving credence to the well-known Swiss reputation for precision. 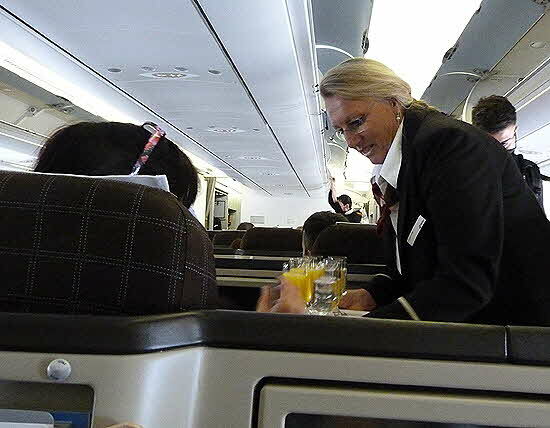 The multi-lingual crew was extremely welcoming with the de rigueur choice of Champaign, orange juice or water extended to Business Class passengers and delivered with a big smile. Once seated, a selection of newspapers were offered along with menus listing a choice of dinner and breakfast items or should you wish to sleep through, a do not disturb request was included and notated by the cabin staff on a seat to seat go-round. Every effort was made to provide maximum comfort to get you to your destination as you wished, which included passing on their great in-flight meals if that was your desire. And most important, the rest rooms while compact were well laid out with amenities of face moisturizer and refreshing spray and kept clean during the entire flight. At each seat was a welcome pack consisting of a knit cap (which proved to be invaluable in the cool rainy autumn Zurich weather) and filled with the usual ear plugs, eye mask, non-skid socks, good sized toothbrush and small toothpaste and nice quality lip balm to combat the dry air circulating on a long flight. A large size pillow and reversible blanket was waiting to provide a comfy rest once the meal service was over and the seat was turned into a flat bed. 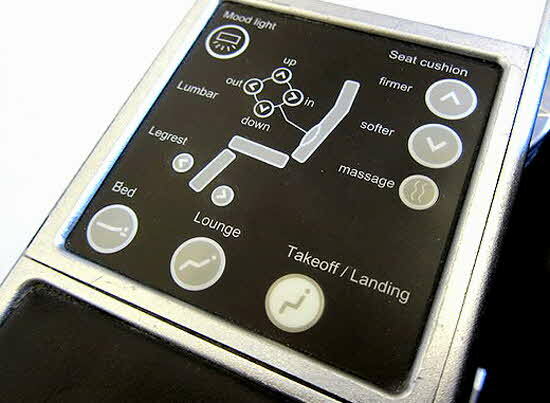 The seats were oversized and comfortable with controls for ”firmer”� “softer” or “massage” in the upright position. The large control consul provided a shelf to store incidental items and a magazine rack with fresh clean copies of the in-flight SWISS magazine. Each seat was an individual compartment with work space providing ample room for a computer or Kindle or any other device people travel with. The in-flight entertainment selection was extensive and the complimentary ear phones were full sized and high-fidelity. Food service was individual based on your menu selection and delivered hot to your food tray on china with real cutlery as you would expect in a restaurant. There was a choice of Venison and mushroom timbale or Char mi-cuit with apple salsa or seasonal salad for First Course and Beef tenderloin, Chicken with PX sauce or Pikeperch in champagne sauce with appropriate sides for the Main course. A Plum and cinnamon mousse or individual cheese cake with cream and chocolate sauce was offered for dessert and of course Swiss chocolates should your sweet tooth require an extra kick. For those wishing to get right to work or to sleep there is a quicker option which turned out to be a really delicious plate of cold roast beef over salad fixings plus a cheese and fruit platter served with crispy warm rolls. 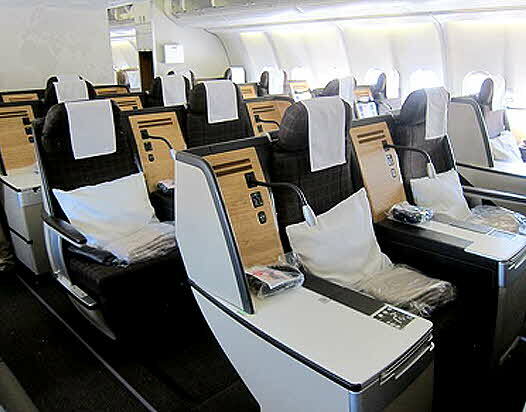 The quality and freshness of the food was truly exceptional even for Business Class in-flight dinning. 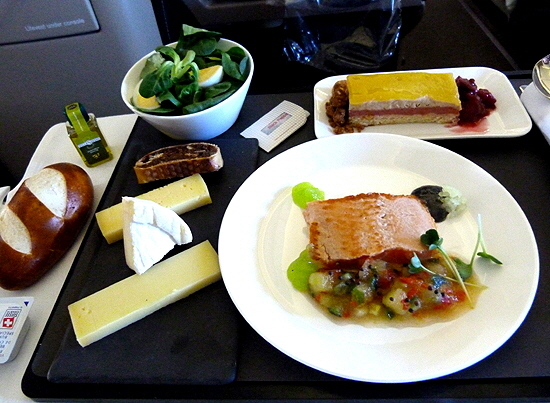 The menu was well chosen, cooked to preference and nicely presented and served, a real plus for an international flight. All in all this flight was one of the most pleasant travel experiences I have had recently and kudos to SWISS for delivering on their offer to “want you to feel at home and enjoy genuine Swiss hospitality in SWISS Business”��.